Rapid Assault campaign prize list is awesome. Just make sure the campaign is super easy so even I can do it. It is easy enough with a ranked and retrofitted fleet of Phoenix or Skyfire. My Skyfire fleet can do the mastery rounds for ~ 4 hours of damage. I tried with my Manticores in PP2 and docked with 9 hours of damage. It only shows up before you start the refit. There is a "Start Build" button and "Instantly Build" button. At that point you are also paying for the resources to complete the build. For example the build I have shown would cost 507 gold to speed up after I start the build. The 667 cost shown accounts for the resources to complete the build as well as the time. Proto-Centurion fleets will not incorrectly trigger maximum weight checks in combat. Proto-Centurion fleets will correctly trigger maximum weight checks in combat. I know dumb right. I guess they expect everyone to join a league and ask for help, as its the only way anyone could possibly do them. OK let me get this straight. My punishers fully ranked and outfitted that could easily do the SDC's lvl 30 are now a useless fleet and can barely do the new legion colonies. I had one punisher survive with a mere sliver of health left. These Punishers could do LVL 52 SDC with significant damage which are worth MORE base parts. Please explain how this is supposed to help players that are attempting to catch up. What is the point of having punishers in the FM now? What is the point of having Punisher tokens in the FM now? Punishers are in the fm to help you get to the zelos, monos, and Icebreakers. I know they are for the fm cause I made an alt a few months ago and those punishers were key in autoing the low level targets and allowed me to quickly get icebreakers and icebreaker tokens to build them with. can we get some 1 hour ship build tokens in the bounty store? damage is pretty minimal with the right technique. but true, if you've already fully built both manti fleets, the prizes are probably not worth it. 18 hours of repair to a dead manticore fleet doing the campaign, are you fckin insane Kix, 18 HOURS REPAIR TO A FLEET, definitely not worth doing. Use sky fire's for the camp - I did 2 mastery runs for ~3 hrs of damage to the flag, but I didn't pay much attention to my driving. Heck it auto'ed the last encounter on the last mastery run because I got bored and still didn't take a lot of damage. Manticore scatter fleet - ugh ,damage sucked. Phoenix fleet (r5, but old missiles) - took a fireball in the head and said thats enough. Skyfire fleet (r5) - worked like a charm. What countermeasure weapons are going to be most effective in the next raid? How many will we need in the fleet? The July and August events will be just like the last 2 events. Thanks for the quick reply.... The countermeasures were revised after the last raid (I think). Will three sprints per fleet be enough? Or will the new MDS be needed since sprints got reduced in effectiveness? EDIT: Not asking about the little buggers that can't really be countered. All of you be quiet! It’s fricking hot as balls here today! not worth doing the way you did it. find a better way - its a strategy game. use some. Sprints are best against the turrets of the big ships on the last 2-raids, and at-least 4x of them for the fleet is enough - THIS IS BEFORE THE FIXED. IF the July event will be something similar to the last VXP weekend (Assault 105s) which is AFTER THE FIXED, Absolutely sprints will not be that efficient anymore. We might need to comeback on this Forum after the 1st few hours or 1st day of the coming raid, for some players who will be kind enough to share a better CM config. Personally, I keep my manti's tokens for this matter. I believe they introduced this new Countermeasure Bug (they call it feature, but we know it is a bug) before June's raid. So this bug should be the same in July's raid as well. Is the problem with not being able to redeem the limited charged armors fixed (CO/CT/M/X) ? They refuse to fix that issue. Every person that wrote to my ticket is vague about it and gives different answers. Someone stated a post from Rampage in which they say the limit is 5. But fun fact is in that post Rampage actually says the limit has been increased and that you can claim the normal amount of charged armors each week. So the person who wrote that answer in my ticket got proven wrong and now they simply refuse to acknowledge they are wrong as hell and they remain vague on purpose in the hopes that people stop asking questions. That is funny since I only have 3 of charge X and M and I own them. Support ticket being sent. the replays are not working again goes to map !!! kix broke it ! So use a different fleet that takes ~70 days to build of the same class yet lower tier? That's what you're saying. Skyfires and Phoenix should not perform better in a campaign that is being pushed as "Manticores Recommended" and requires ownership of the Manticore print just to get into the first battle. That's broken design. no. i'm saying use some strategy with what you have. like in the good ole days when you actually had to figure out targets. manticores can cruise through the campaign easily with far less than 18 hours of repairs. that said, i hadnt really considered him using a different fleet, but you make a good point, if he already has a sky/phoenix fleet, his statement is even worse as he has even more options. It would be more to the player base liking to lower the build and refit and repair costs time ect,ect titanium cost is really null ! Why does one take damage just by launching the just by launching the haymaker drones, it is only some seconds, it does not hurt me, but does it really help kix to skim off a little from each player, or is it a bug. I sincerely hope it is a bug, for otherwise kix will set a new record for cheapness. Talking about that, kix ' fixed ' the dead bases by letting the shipyard repair? It is hardly more exciting to hit a dead base with just a shipyard than it is to find it completely dead. Please let that only be a mistake following bounty. It is not a bug at all, it is on the blueprint. The Caedes drones have this same effect on it also. 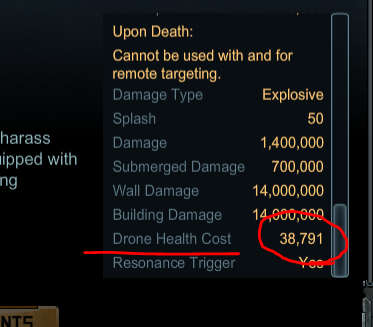 Understood mate, but I don't talk about a drone being destroyed, just launched and flattened a dock, 1 min and some seconds damage, nothing that can fire at you. Health cost to me said if you lost it. So the prize for the rapid assault campaign (which you need a manticore fleet to even try it) is manticore build tokens. There isnt anyone at kixeye that realizes the stupidity of this?? ?